There’s a special orchid in flower right now in the tropical greenhouse. Its name is Dryadella pusiola, and it’s special because its flowers are very, very small. 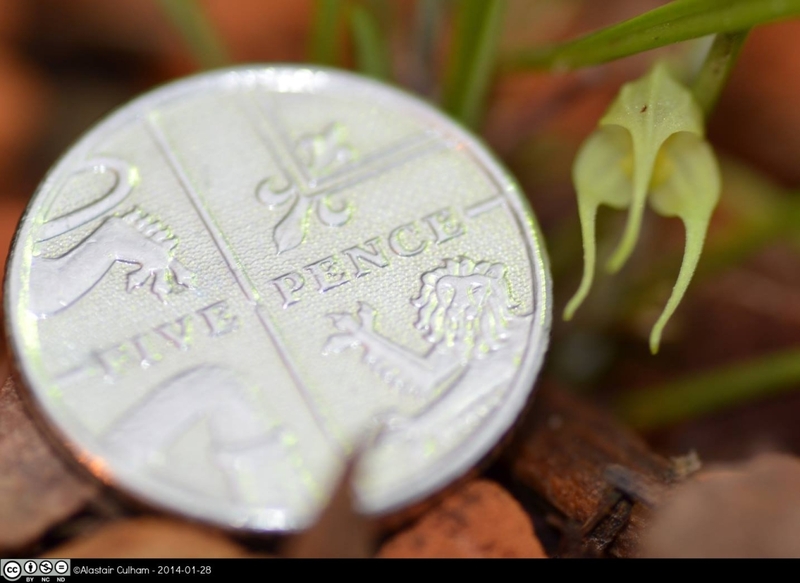 Small enough to be dwarfed by a 5p! This orchid is the first to flower from a donation to the Greenhouse from Dr William Purvis, which arrived this winter. Looking at the flowers, you may not instantly think that it was an orchid, as it doesn’t have the instantly recognisable 3 sepals, 2 petals, and a lip formation. At first glance it only appears to have 3 large, almost fused tepals, but in fact the 2 petals and the lip are highly shrunken, held deep within the flower. Whilst the flower of Dryadella pusiola is narrow enough to be considered one of the smallest orchid flowers ever, it loses out on being the smallest to an as yet un-named orchid from Ecuador, which has a flower that is around the same width, at 2mm (Kaufman, 2009)1, but is much flatter than the flower of D.pusiola. The name Dryadella comes from the Greek word Dryad, which translates to a Tree-nymph (Homer, 7-6 Century BC)2. This is very fitting for this little orchid, as the Dryads were supposed to be small, and whilst not the most fantastic looking demi-gods, they were supposed to be attractive. This little flower fills that role. It may not be the biggest or flashiest orchid, but it certainly has its charms. Dryadella pusiola is not just a small flowering orchid; it’s a small orchid in its own right, growing to form small grass-like tufts of thinly leaved shoots. These tufts will not get much larger than around 5cm in diameter and height. 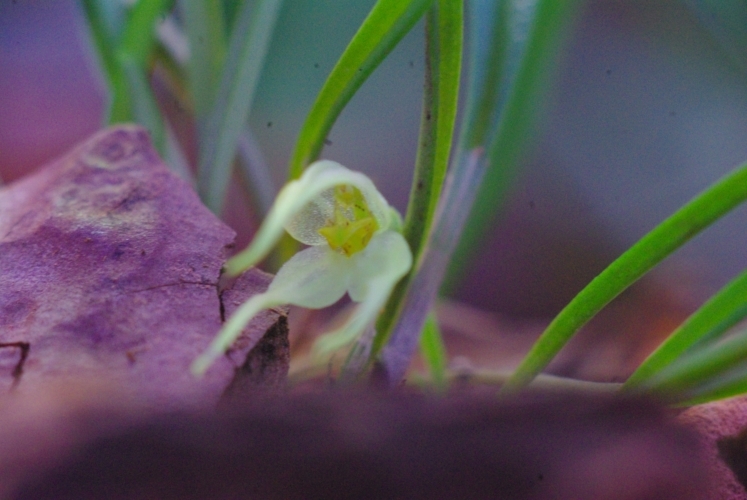 Dryadella do not produce pseudobulbs, but instead prouduce single leaves from a creeping rhizome, and will produce flowers from much the same location (IOSPE, 2014)3. All of the Dryadella pusiola plant! The whole genus Dryadella used to be part of the Masdevallia genus. They are both very similar in range, with the range of Masdevallia covering all of Mexico, Central and South America (Cullen, 19924, Hessayon, 2010)5. 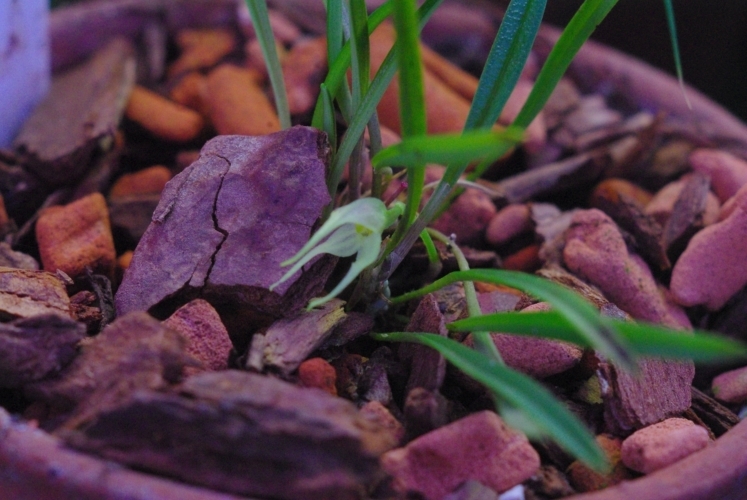 Dryadella was split off from Masdevallia in 1978, according to the WCSP (2014)6, which was the date at which the Dryalella pusiola name was accepted. Dryadella’s range is from Columbia to Ecuador, at high altitudes (WCSP, 2014)7. Due to the similarity between Masdevallia and Dryadella, the care conditions for Dryadella can be assumed to be the same as for Masdevallia. This means that they should be kept in cool slightly shaded conditions. This means a temperature of around 16-21oC, and an east or west facing window, when grown in the UK (Hessayon, 2010)8. Dryadella does not currently appear to be for sale, at least in the UK, unfortunately. This is not surprising, as small flowering orchid species do not often sell. It is also not a well-known genus. It may well be possible, however, for the determined to contact specialist nurseries, should they desire one. Unless otherwise marked, all photos are the property and copyright of Andrew, and come under the following license. Thanks to C.Prouatt for the help with ancient Greek references. Andrew is reading a Plant Diversity Masters in Reading. He is interested in the wide range of forms which plants can take, especially groups with unusual features. He has a particular interest in orchids, of which he has a growing collection of. This entry was posted in Americas, Countries, Mexico, Monocots, Species and tagged America, donation, Dryadella, Dryadella pusiola, flower, Masdevallia, Mexico, Orchid, Orchidaceae, pusiola, small. Bookmark the permalink.